This pub is accessed via some scarily narrow roads barely wide enough for a car. It’s an L-shaped pub - one part dining area, and the other for the drinkers. The landlord, landlady and promoter are all excellent hosts. The gig is free to the public, but they still seem to find a way to make it work. I’ve been here a few times now, and I’m getting to know the regulars. We had a good gig and sold lots of CDs. Look forward to the next one here! I grew up in Derby, so it’s a bit of a homecoming doing a gig here. I haven’t played the VoiceBox before. 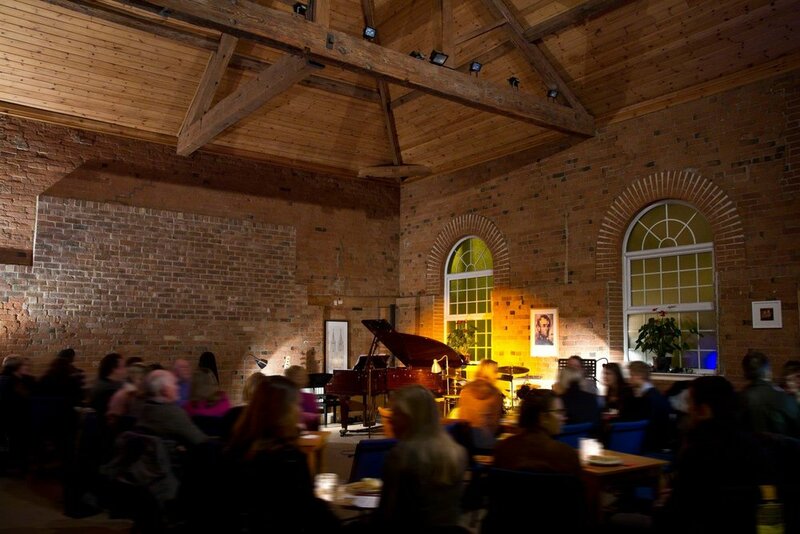 It’s a high ceilinged space with a generously reverberant acoustic and a nice Schimmel grand piano. We played at a sensitive level with no PA and I enjoyed the sound immensely. The room was full and many familiar faces were there, including Pete Wraight (MD for Matthew Herbert), Andrew Stanton (the man responsible for getting me to listen to the right stuff!) and Mike Say (former neighbour and drummer in my first band). Graham Harvey and I came straight from marking our Leeds College of Music students' end of term jazz gig at Toulouse Lautrec Venue. When we arrived at 10:30 we were told we were not allowed in the club until the main band had finished. Hmmm.... so the band doing the late set cannot hear the last couple of tunes of the main band? It was not sold out, so there would have been space. I can’t quite see the point of enforcing this. When we were allowed in, of course the audience for the main show fled in droves, leaving a few die hard night owls and a trickle in of the Late Show hangers and musicians. Alex Garnett's introductions were fun and we had a great set. After a 20 minute break we played “Alone Together” with Garnett and then hung out at the bar while the jam got going. Some familiar and some unfamiliar faces sat in and the standard was pretty high. I played 2 more tunes for the evening, then around 2:45 we finished up. Graham and Seb both stayed over at mine, as we all had early teaching duties the next day (Seb on 1 hour sleep, me and Graham on 4) which kind of makes the point why the established older players don’t hang at the jam - because we're working in the day! Anyway, it was fun, and you don’t have to fly anywhere to get jetlag!